Boys' Class "A" tournament at St. Paul's School (Concord, NH). Boys' Class "B" tournament at Westminster School (Simsbury, CT). Boys' Class "C" tournament at Portsmouth Abbey School (Portsmouth, RI). 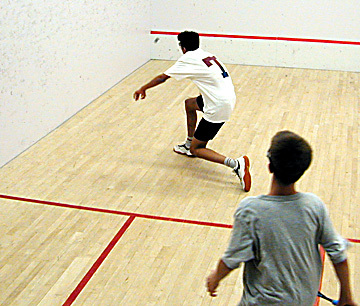 The New England Interscholastic Squash Association (NEISA) is the organizing body of boys' squash among independent schools in New England. The Association welcomes all squash-playing schools that are members in good standing of the New England Preparatory School Athletic Council (NEPSAC). There are currently forty member schools in the Association. For over sixty years, the NEISA has run a championship tournament in late February. The current format divides schools into three classes. In the championships, seven players from each school accrue team points based on their performance in against opponents at the same ladder position. There is a strong emphasis on participation in the event: players are guaranteed a minimum of three matches over the course of the weekend and most play more. In 2017, Brunswick School won the Class "A" team title, Phillips Exeter Academy won the Class "B" team title, and Portsmouth Abbey School won the Class "C" team title. At the end of each season, the Association awards the Brandes Trophy in recognition of the team with strongest dual match record in the regular season. The NEISA also sponsors Team Sportsmanship Awards given to the squads best exhibiting standards of fair play and sportsmanship as voted by Association teams. In 2017, the Brandes Trophy was won by Brunswick School and the Team Sportsmanship Awards were won by Brooks School and Pomfret School. The NEISA is governed by a five-person Executive Committee. Four members of the Committee are elected from among the coaches of member schools; the Association's Executive Director serves on the Committee ex officio. Each February, coaches elect one representative from the north/east region and one from the south/west region to serve two-year terms on the Committee. Members of the 2017–2018 NEISA Executive Committee are: Doug Burbank (Brooks School); Peter Doucette (Westminster School); David Prockop (Groton School); Chris Smith(ex officio); and Jasper Turner (Berkshire School). The Executive Committee is charged with overseeing the championship tournament—including seeding and making the draws—as well as standardizing rules, procedures, and practices for the sport during the regular season. 2016 NEISA Championships at Deerfield Academy, Choate Rosemary Hall, and Portsmouth Abbey School. For complete individual results, please click here (Class "A") or here (Class "B") or here (Class "C"). 2015 NEISA Championships at Groton School, Loomis Chaffee School, and Portsmouth Abbey School. 2014 NEISA Championships at Brooks School, Pomfret School, and Portsmouth Abbey School. For final team results, please click here. 2013 NEISA Championships at Deerfield Academy, Avon Old Farms School, and Portsmouth Abbey School. 2012 NEISA Championships at Phillips Exeter Academy, Choate Rosemary Hall, and Suffield Academy. 2011 NEISA Championships at Salisbury School, Brooks School, and Suffield Academy. 2010 NEISA Championships at Phillips Exeter Academy, Salisbury School, and Suffield Academy. 2009 NEISA Championships at Deerfield Academy, Groton School, and Suffield Academy. For complete individual results, please click here (Class "A") or here (Class "B"). 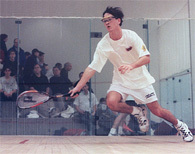 Copyright © 1997–2017 New England Interscholastic Squash Association. All rights reserved.